I love the styles I see out now in the stores. Usually it is hard to find pretty things and I think many styles that are usually in style are not very feminine in nature. I gravitate toward clothing that is pink or ruffly, and if it has a rose on it, even better! I was so happy to see that flowers were in this past summer and hope to see it continued in fall. This reminds me of how cozy sweaters can be, especially curling up on the couch with a quilt and good book in hand! 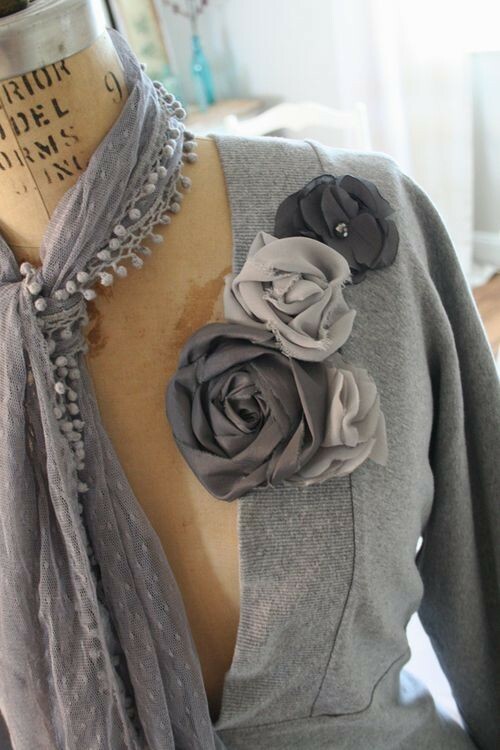 I love this rose look and had purchased several shirts this summer like this--I hope the keep it through the winter. My daughter and I both are hoping they will! For a while I kept my clothing pretty simple because I was either pregnant or busy with little children. I am trying to change my look this year to something fresher, and to look nicer for my husband, but yet still practical and not spend too much. Trust me, I am not a fashionista by any means (I know some of you are)...but I do like pretty things! 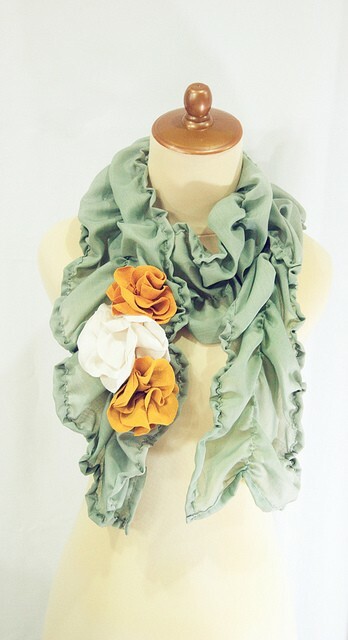 And ruffly scarves---I have seen a few I liked this year and thinking about getting one. but it would sure look pretty! I know most people don't dress like this anymore, but I like how classy and feminine they look. They remind me of the 60's--a much simpler time. Hope you are enjoying this cozy fall day! I LOVE this style of clothing! Every picture you posted is exactly my style. Only thing is, most of my clothes are from a few years ago. I need to update my closet! TFS! 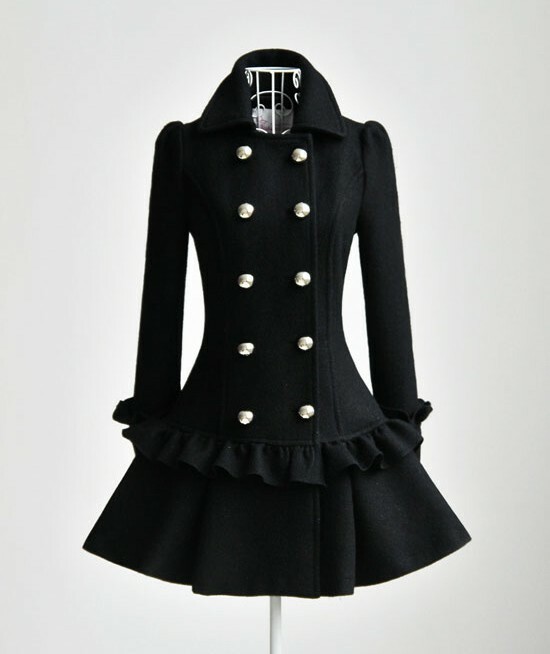 Can you comment on where the coats are available or sold? I have not seen patterns for them but hopefully there will be some coming out in the pattern books, soon. OOO!! This has been my most favorite styles as well ,love the colors love the style! What store are the coats from? I'd love to have that black one. Those outfits are just gorgeous!!! and so feminine, love it! Any links for purchasing? Love these looks!! Hello June, I like this particular post on style for christian women! I think it is wonderful that god gives us the creativity to adorn and dress ourselves with things that makes us feel pretty and womanly! We don't have to sacrifice trendy clothing to glorify god, we can always be creative and mix and match trends with what we already have. I love the feminine ruffles and flower trend too! 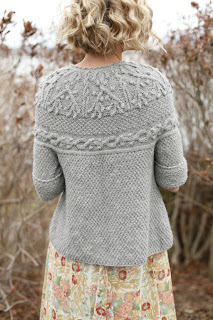 Thanks for posting these pretty clothes that is timeless and tasteful! I think everything you posted was beautiful! I'm trying to be more feminine in my dress as well. Love it! I've been loving the more classic, feminine styles that I'm seeing in stores, too. Suddenly, it's not so hard to find a ladylike skirt! I love the sweater in the second picture. Where is that from? I'm a past dresser so I LOVE the fact that these styles are coming back! YAY! Some of the 60-70's stuff that's returning I could live without, but it's definitely becoming more feminine. 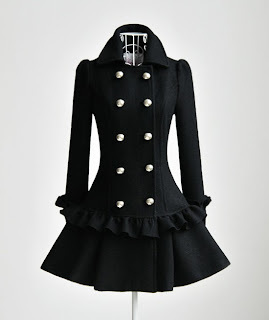 I don't like ruffles that much myself, but that ruffle coat was lovely! Oh that is so my style. I am finding lots of inspiration on pinterest and have pinned on my 'feminine and fashionable' board quite a number of dresses that also feature ruffles and roses. Last year I started buying most of my family's clothing online at a site that heavily discounts designer clothing. 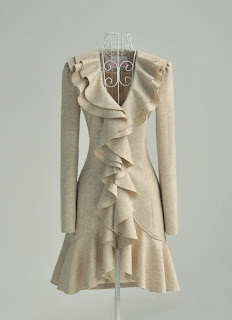 There are still many immodest styles on sale but I have been fortunate to find some quite lovely dresses and jackets similar in style to the ones you featured. 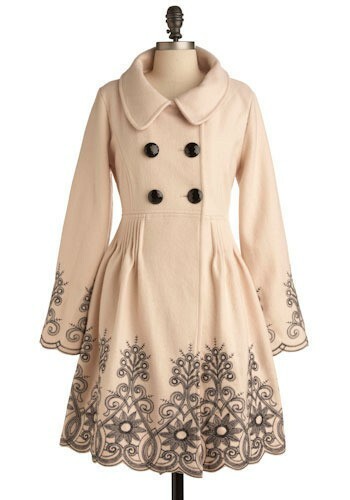 I purchased a trench style jacket trimmed with lace which I feel so feminine in. I am noticing that the current trend for vintage style is having an impact. I have seen some of the young women who used to dress very casually to church turning up in lovely 50's style floral dresses. Beautiful and modest. What a transformation. I make sure I compliment them and let them know how lovely they look in the hope that they will continue to dress beautifully even when the vintage trend dies down. I have been on a mission for the last three months to have a much fresher style at my husband request as well. I don't spend money on fashion, so thrifting is my passion. It has given me an entire wardrobe for pennies from what I would pay retail and I look awesome!!! My husband sooo loves my new look and I'm happy too. Ooo, I love all these pretty, feminine clothes! Thanks for sharing! Oh, this is my style exactly! I LOVE ruffles, flowers, and PINK! I'm so happy to see feminine clothing on department store racks again this season.